3. Walk carefully watching your steps. 5. 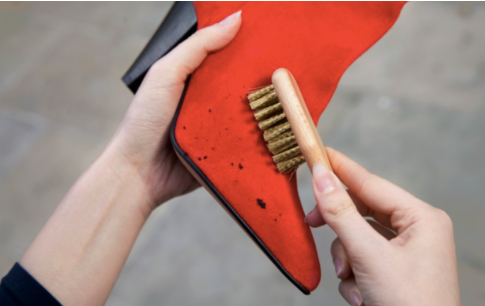 Don't forget to brush the dust/dirt off the shoes with the soft-bristle brush. Use shoe polish if needed. Use shoe trees for keeping the shape of your shoes. ​ Keep your shoes in dust bags or cardboard boxes in dry conditions . Don't seal the product into a plastic bag or box for months at a time to avoid product to get mouldy. 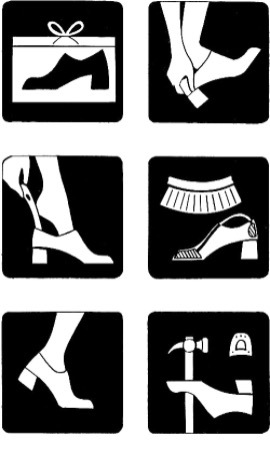 If your footwear has become wet, dry it at room temperature. For wet leather shoes, stuff them with paper to their natural shape (not any bigger) and let them dry, away from a heat source. The next day give them a good brushing to bring back the nap. If the leather has become dirty, clean it gently with a sponge with some leather balm or cream. Use a small amount and apply a thin and even layer, for example with a sponge. Wipe off the excess with a clean and dry cloth. Always try first on a small surface to see how the color changes before you treat the whole shoe. Note that greasing will also soften the leather a bit. For light coloured leather, use natural color shoe polish, for black leather is better to use black colour treatment as it will enhance the color and shine. Special suede protection spray can be used to protect the suede footwear from stains and water damage. Use soft clean brush(sponge) or special suede brush to clean suede from dust and dry dirt. If your suede product has become wet, dry it at room temperature. Don’t rub any suede product while it is wet. If your suede shoe has dry spots, try rubbing them away gently with a clean pencil eraser or a suede cleaning block. Thanks for sharing the tips. Very helpful post.